Government ministers have rejected calls for a ‘latte levy’, which would involve a charge on throwaway cups in a bid to try and cut down on their use. Mary Creagh, the chair of the environmental audit committee, accused the government of talking warm words, but taking no action after ministers refused to adopt a charge on throwaway coffee cups, that would be similar to the plastic bag tax. It comes after the environmental secretary Michael Gove once again failed to introduce a plastic bottle deposit scheme, despite Theresa May pledging that she will declare war on single-use plastic. Creagh responded to the government not taking up the call for a levy by saying, “The UK’s throwaway culture is having a devastating impact on our streets, beaches, and seas. “Our report recommended practical solutions to the disposable packaging crisis. The environmental audit committee’s key recommendation on reducing coffee cup waste was the introduction of a 25p levy to help fund recycling measures. This was judged to be the most effective way to change consumer behaviour. Currently, some coffee shops offer incentives to customers for bringing their own takeaway coffee cups in, instead of getting a disposable one. Pret a Manger recently announced that it will give customers 50p off their drink price if they use a reusable cup, a rise from the 25p discount it was already doing. This means that if you get a coffee every day from Pret, bringing a reusable cup would save £182.50 a year. Starbucks and Costa also do a reduction of 25p, and bakery chain Paul offers a 10p discount for bringing in a cup from home. Starbucks has also trialled a scheme similar to the proposed latte levy, where in some shops in London, customers are charged an extra 5p for using a disposable cup. Disposable coffee cups can’t be recycled by normal systems. 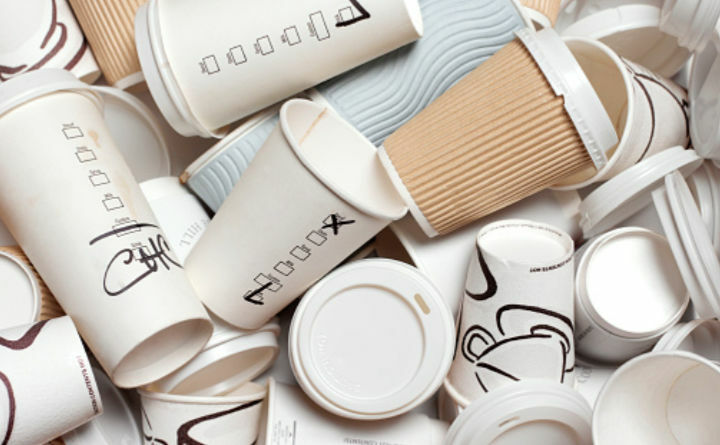 Half a million coffee cups are thrown away each day in the UK, and just 0.25% are recycled. A spokesperson for Defra said, “It is wrong to say the government is not taking decisive action.